Abstract Knowledge of the diet source and trophic position of organisms is fundamental in food web science. Since the 1980s, stable isotopes of light elements such as 13C and 15N have provided unique information on the food web structure in a variety of ecosystems. More recently, novel isotope tools such as stable isotopes of heavy elements, radioisotopes, and compound-specific isotope analysis, have been examined by researchers. Here I reviewed the use of compound-specific nitrogen isotope analysis of amino acids (CSIA-AA) as a useful dietary tracer in food web ecology. Its three key features—(1) offsetting against isotopic variation; (2) universality of the trophic discrimination factor; and (3) sensitivity to source mixing—were compared with conventional isotope analysis for the bulk tissue of organisms. These three advantages of CSIA-AA will allow future researchers to (1) estimate the integrated trophic position (iTP) of animal communities; (2) infer trophic transfer efficiency (TTE) in food webs; and (3) quantify contributions from different resources to animals, all of which are crucial for understanding the relationship between biodiversity and multi-trophic ecosystem functioning. Further development of trophic ecology will be facilitated by both methodological refinement of CSIA-AA and its application to a wider range of organisms, food webs, and ecosystems. Naoto F. Ishikawa is the recipient of the 21st Denzaburo Miyadi Award!! 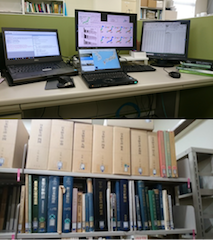 You can see the data paper by Naoto F. Ishikawa et al. 2018. Abstract The barn swallow, Hirundo rustica, is a model species for studying sexual selection, particularly female mate choice. Although there have already been several reviews of female mate choice and its geographic variation in this species, all of them have focused on secondary sexual characteristics. Here, for better understanding of the general pattern of female mate choice and their influence on male phenotype, I review all of the female mate choice criteria ever reported in the barn swallow, emphasizing the importance of relatively inconspicuous male traits. These include resources defended or provided by males, such as territory and paternal investment. In addition, females prefer a nestling-like vocalization, enticement call, which is particularly noteworthy because females prefer immature calls. This pattern contrasts with female choice based on secondary sexual characteristics, in which more mature, elaborate male traits are almost always favored. Nestling-like male traits are widespread, and thus female avoidance of, rather than preference for, mature forms might be common. In addition to selection on the target trait itself, these resources and nestling-like male traits would also matter in understanding the evolution of the overall male phenotype and its geographic variation, due to the interrelationships among male target traits and those among female mate preferences. Female preferences for inconspicuous traits are highly dependent on ecological factors such as nest predation pressure, and thus overall male phenotype including secondary sexual characteristics might be more predictable than previously thought. Future studies should focus on not only conspicuous secondary sexual characteristics but inconspicuous male traits. Masaru Hasegawa is the recipient of the 4th Suzuki Award!! Abstract Mast seeding, the synchronous intermittent production of large seed crops in populations of perennial plants, is a widespread and widely studied phenomenon. Economy of scale has been demonstrated to provide the ultimate selection factor driving the evolution of masting, for example, in terms of the predator-satiation and pollination-efficiency hypotheses; however, its physiological mechanism is still poorly understood. The resource budget (RB) model assumes that an individual plant requires more resources to flower and fruit than it gains in a year, and therefore only flowers when a specific threshold amount of stored resources is surpassed. Although the RB models have been well explored theoretically, including for resource depletion and pollen coupling, empirical data to support these assumptions are still disputed. Here, we explore the extent to which the RB model applies to masting tree species, focusing on the dynamics of carbon and nitrogen resources in natural temperate forests. There is little empirical evidence that plants use carbohydrates stored over several years to produce fruits; however, nitrogen stores in temperate trees are more commonly depleted after masting. We review the internal nitrogen cycle including resorption during leaf senescence, storage and remobilization, discussing the effect of masting on these processes. Overall, carbohydrates and nitrogen are clearly involved in the proximate mechanisms driving mast seeding, but the determinant resource seems to be species specific. Qingmin Han is the recipient of the 8th Oshima Award!! Abstract Natural systems are often complex and dynamic (i.e. nonlinear), making them difficult to understand using linear statistical approaches. Linear approaches are fundamentally based on correlation. Thus, they are ill-posed for dynamical systems, where correlation can occur without causation, and causation may also occur in the absence of correlation. "Mirage correlation" (i.e., the sign and magnitude of the correlation change with time) is a hallmark of nonlinear systems that results from state dependency. State dependency means that the relationships among interacting variables change with different states of the system. In recent decades, nonlinear methods that acknowledge state dependence have been developed. These nonlinear statistical methods are rooted in state space reconstruction, i.e. lagged coordinate embedding of time series data. These methods do not assume any set of equations governing the system but recover the dynamics from time series data, thus called empirical dynamic modeling (EDM). EDM bears a variety of utilities to investigating dynamical systems. Here, we provide a step-by-step tutorial for EDM applications with rEDM, a free software package written in the R language. Using model examples, we aim to guide users through several basic applications of EDM, including (1) determining the complexity (dimensionality) of a system, (2) distinguishing nonlinear dynamical systems from linear stochastic systems, and quantifying the nonlinearity (i.e. state dependence), (3) determining causal variables, (4) forecasting, (5) tracking the strength and sign of interaction, and (6) exploring the scenario of external perturbation. These methods and applications can be used to provide a mechanistic understanding of dynamical systems. 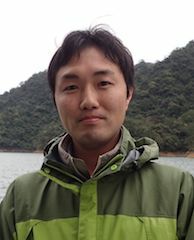 Chih-hao Hsieh is the recipient of the 18th Biwako Prize for Ecology!! Abstract Community ecology is traditionally species-based and assumes that species comprise identical individuals. However, intraspecific variation is ubiquitous in nature because of ontogenetic growth and critical in food-we dynamics. 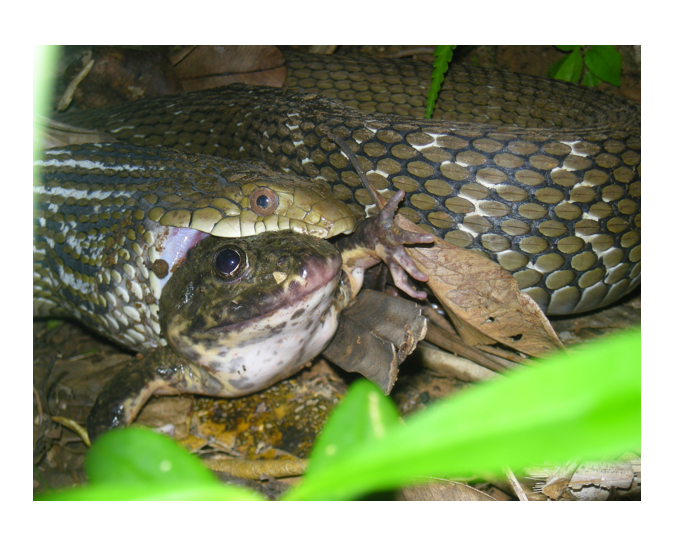 To understand individual interaction-mediated food webs, researchers have recently focused on body size as the most fundamental biological aspect and assessed a parameter called the predator-prey mass ratio (PPMR). Herein, I review the conceptual development of the PPMR and suggest four major concerns regarding its measurement: (1) PPMR should be measured at the individual level because species-averaged values distort actual feeding relationships, (2) individual-level PPMR data on gape-unconstrained predators (e.g., terrestrial carnivores) are limited because previous studies have targeted gape-limited fish predators, (3) predators' prey size selectivity (preferred PPRM) is conceptually different from dietary prey size (realized PPMR) and should be distinguished by incorporating environmental prey abundance information, and (4) determinants of preferred PPMR, rather than those of realized PPMR, should be identified to describe size-dependent predation. Future studies are encouraged to explore not only predation but also other interaction types (e.g., competition, mutualism, and herbivory) at the individual level. However, this is not likely to occur while ecological communities are still considered to be interspecific interaction networks. To resolve this situation and more comprehensively understand biodiversity and ecosystem functioning, I suggest that community ecology requires a paradigm shift in the unit of interaction from species to individuals, similar to evolutionary biology, which revolutionized the unit of selection, because interactions occur between individuals. Takefumi Nakazawa is the recipient of the 20th Denzaburo Miyadi Award!! Abstract Elucidating the mechanism shaping the spatial variations of traits has long been a central concern of evolutionary biologists. Geographic clines of allele/morph frequencies along environmental gradients are suggested to be established and maintained by the balancing of two opposing evolutionary forces, namely selection that generates spatial differentiation in morph frequencies, and selection and/or stochastic factors that lead to the coexistence of multiple morphs within a population. Thus, testing for both selection and stochastic factors is necessary for a comprehensive understanding of the mechanism underlying clinal variation in morph/allele frequency in natural populations. Here, I identified the evolutionary forces responsible for clinal variation of color morph frequency in Ischnura senegalensis by comparing the population divergence of putatively neutral loci generated by high-throughput next-generation sequencing (F[STn]) with that of the putative color locus (F[STc]). No strong correlation was observed between F[STn] and F[STc], suggesting that stochastic factors contribute less to color-locus population divergence. F[STc] was less than FSTn between populations exposed to similar environmental conditions, but greater than F[STn] between populations exposed to different environmental conditions, suggesting that both balancing selection and divergent selection act on the color locus. Therefore, two antagonistic selection factors rather than stochastic and historical factors contribute to establishing the clinal variation of morph frequency in I. senegalensis. Yuma Takahashi is the recipient of the 19th Denzaburo Miyadi Award!! Abstract Trophic fractionation of carbon and nitrogen isotopes (Δδ13C, Δδ15N) was examined using previously complied databases for food chains in Lake Biwa, Lake Baikal, and Mongolian grassland. The following two features were clarified: (1) For each ecosystem, the ratios of trophic fractionation of carbon and nitrogen isotopes (Δδ15N/Δδ13C) throughout food chain could be obtained as the slope of linear regression line on the δ15N–δ13C plot. (2) Further, analysis of covariance (ANCOVA) revealed the slopes on 15N–δ13C were not significantly different among these various ecosystems and allowed us to have the regression by setting δ15N as the response variable: δ15N = 1.61 δ13C + [ecosystem specific constant] with standard errors of [±0.41] and [±9.7] for the slope and the intercept, respectively. It was suggested that the slope of the regression (or the ratio Δδ15N/Δδ13C) could be applicable to more complicated food webs in case nitrogen and carbon isotope ratios of primary producers can be assumed constant in space and time within the ecosystems. The results from simple linear regression analyses coincided well with the ANCOVA results for these ecosystems, although there was some discrepancy between the results of the two statistical analyses. Possible factors that govern the linear relationship between δ15N and δ13C along a food chain are discussed together with a new scope for the stable isotope food chain analyses. 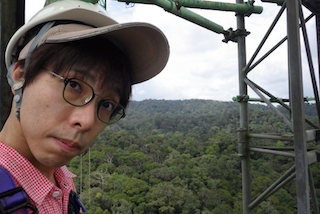 Eitaro Wada is the recipient of the 7th Ecological Society of Japan Award!! 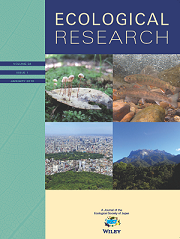 Abstract This paper reports seasonal data regarding leaf litter for 14 deciduous broad-leaved species and one evergreen coniferous species as well as leaf area index (LAI) data for the 14 deciduous broad-leaved species in a cool-temperate deciduous broad-leaved forest in Japan. The seasonal leaf biomass of various tree species is important for accurately evaluating ecosystem functions such as photosynthesis and evapotranspiration under climate change. However, there is a lack of freely available, long-term data. We collected litterfall every 1 to 4 weeks from September or October to November or December each year from 2005 to 2014 in Takayama, Japan (36°08′46″N, 137°25′23″E, 1420 m a.s.l.). After sorting the litter into leaves (according to species categories), stems + branches, and “other”, we dried and weighed the litter groups. We also collected seasonal leaf data (number of leaves and leaf length and width) for each broad-leaved species, which we recorded every 1 to 4 weeks from April or May to October or November using multiple target shoots. To estimate the LAI in autumn for each deciduous broad-leaved species, we used a semi-empirical model of the vertical integration of leaf dry mass per unit leaf area. To estimate the LAI in spring and summer, we used the relationship between the LAI in autumn and the seasonal leaf data. Our data provide input, calibration, and validation parameters for determining LAI based on satellite remote-sensing observations or radiative transfer models and for use in ecosystem models. Abstract Protected areas function as a lifeboat that can preserve the origins and maintenance of biodiversity. 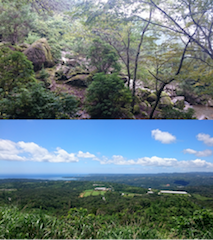 We assessed the representativeness of biodiversity in existing protected areas in Japan using a distribution dataset and phylogenetic tree for 5565 Japanese vascular plant species. We first examined the overlap of species distribution with the existing protected areas and identified the minimum set representing all plant species. Second, we evaluated the relative importance of environmental variables in explaining the spatial arrangement of protected areas using a random forest model. Finally, we clarified how potential drivers of plant diversity were sufficiently captured within the protected areas network. Although the protected areas captured the majority of species, nearly half of the minimum set areas were selected from outside the existing protected areas. The locations of existing protected areas are mainly associated with geographical and socio-economic factors rather than key biodiversity features (including evolutionary distinctiveness). Moreover, critical biodiversity drivers, which include current climate, paleoclimatic stability, and geographical isolation, were biasedly emulated within the existing protected areas. These findings demonstrate that current conservation planning fails to represent the ecological and evolutionary processes relevant to species sorting, dispersal limitation, and allopatric speciation. In particular, under-representativeness of historically stable habitats that function as evolutionary hotspots or refugia in response to climate changes may pose a threat to the long-term persistence of Japan’s endemic biota. This study provides a fundamental basis for developing prioritization measures to retain species assembly processes and in situ diversification along current climatic and geohistorical gradients. Abstract Tree hollows often harbor animals and microorganisms, thereby storing nutritive resources derived from their biological activities. 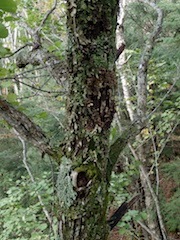 The outflows from tree hollows can create unique microenvironments, which may affect communities of epiphytic organisms on trunk surfaces below the hollows. 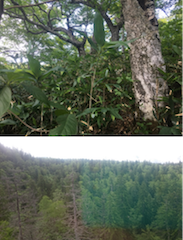 In this study, we tested whether the species richness and composition of epiphytic bryophytes (liverworts and mosses) and lichens differ above and below tree hollows of Aria japonica and Cercidiphyllum japonicum in a Japanese temperate forest. The species richness of epiphytic bryophytes and lichens did not differ above and below hollows; however, the species composition of bryophytes differed significantly above and below hollows. Indicator species analyses showed that the moss species Anomodon tristis and the liverwort species Porella vernicosa were significantly more common below than above hollows, while the liverwort species Radula japonica and four lichen species, including Leptogium cyanescens, occurred more frequently above than below hollows. Our results highlight that tree hollows can produce unique microenvironments on trunk surfaces that potentially contribute to the maintenance of epiphytic diversity on a local scale. Abstract Geographic variations in reproductive traits are important for evolutionary biology, but often difficult to investigate because of the need for a large-scale survey and the ephemeral nature of secondary sexual characteristics. Here, using web image searches (Google Images and Twitter), we revealed large-scale geographic variations (>1500 km) in breeding timing and nuptial coloration in the mutually ornamented fish, Japanese dace (Tribolodon hakonensis). 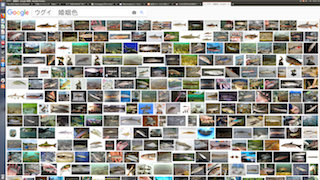 As this fish is easily caught and many anglers upload their photographs on the web, we were able to find a total of 401 high-resolution photographs from all over Japan. Breeding periods were determined from dates of photographs with/without nuptial coloration, which matched with previous studies. We also found that breeding periods might have advanced three weeks over the last 80 years in the Chitose River, potentially because of climate change. Additionally, the pattern of latitudinal cline for breeding timing revealed delayed timing in higher latitudes, although regional variations were also high. Finally, we quantified the patterns of nuptial coloration for this mutually ornamented fish, and confirmed that over 80% of individuals showed typical colorations, but others showed rare phenotypes that were never previously described, including an intermediate coloration between T. hakonensis and a potentially hybridizing species, T. brandtii. 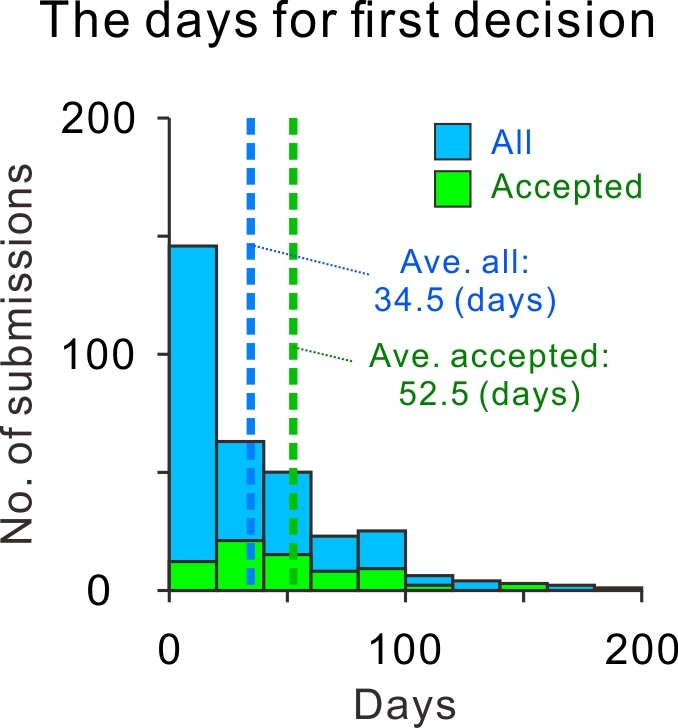 Our web-based method for estimating breeding phenology could be adopted for organisms with temporal sexual characteristics, such as plants (e.g., flowering time) and some fishes. Web image analyses are still preliminarily with many limitations, but could be promising for investigating variations in visible traits. Abstract Climate change is affecting the composition and functioning of ecosystems across the globe. Mountain ecosystems are particularly sensitive to climate warming since their biota is generally limited by low temperatures. Cryptogams such as lichens and bryophytes are important for the biodiversity and functioning of these ecosystems, but have not often been incorporated in vegetation resurvey studies. Hence, we lack a good understanding of how vascular plants, lichens and bryophytes respond interactively to climate warming in alpine communities. Here we quantified long-term changes in species richness, cover, composition and thermophilization (i.e. the increasing dominance of warm-adapted species) of vascular plants, lichens and bryophytes on four summits at Dovrefjell, Norway. These summits are situated along an elevational gradient from the low alpine to high alpine zone and were surveyed for all species in 2001, 2008 and 2015. During the 15-year period, a decline in lichen richness and increase in bryophyte richness was detected, whereas no change in vascular plant richness was found. Dwarf-shrub abundance progressively increased at the expense of lichens, and thermophilization was most pronounced for vascular plants, but occurred only on the lowest summits and northern aspects. Lichens showed less thermophilization and, for the bryophytes, no significant thermophilization was found. Although recent climate change may have primarily caused the observed changes in vegetation, combined effects with non-climatic factors (e.g. grazing and trampling) are likely important as well. At a larger scale, alpine vegetation shifts could have a profound impact on biosphere functioning with feedbacks to the global climate. Abstract It has been estimated that more than 48% of global methane emissions from lakes and reservoirs occur at low latitudes (<24°). To improve this estimate, knowledge regarding underexplored ecosystems, particularly deep lakes and reservoirs in Asian monsoon regions, is needed because the magnitude of methane emissions is influenced by lake bathymetry and climatic conditions. 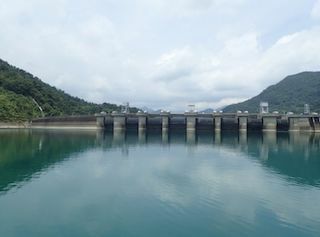 We conducted long-term studies beginning in 2004 at Feitsui Reservoir (FTR) in Taiwan, a subtropical monomictic system with a maximum depth of 120 m to monitor seasonal and interannual variations of three key characteristics and to understand the mechanisms underlying these variations. Key characteristics investigated were as follows: (1) the balance of primary production and heterotrophic respiration as a determinant of vertical oxygen distribution, (2) methane production at the bottom of the reservoir, oxidation in the water column, and emissions from the lake surface, and (3) the contribution of methane-originated carbon to the pelagic food web through methane-oxidizing bacteria (MOB). This review highlights major achievements from FTR studies integrating isotopic, microbial, and modeling approaches. Based on our findings, we proposed two conceptual models: (1) a model of methane dynamics, which addresses the differences in methane emission mechanisms between deep and shallow lakes, and (2) a spatially explicit model linking benthic methane production to the pelagic food web, which addresses the diversity of MOB metabolisms and their dependence on oxygen availability. Finally, we address why long-term studies of subtropical lakes and reservoirs are important for better understanding the effects of climate on low- to mid-latitude ecosystems.